With the current petroleum prize again reaching record highs, interest is once again focusing on alternative methods of propulsion and one likely contender is the fuel source called hydrogen. This device below will produce small amounts of both oxygen and hydrogen for you to experiment with. The unit is made from storm water pipe and the measurements are not critical and you can use anything you can put your hands on,as long as it made from plastic. Do not use metal pipe as this will soon become unserviceable due to the caustic soda we place in the water to make it conductive at a later stage. You will need 2 plastic storm water pipe elbows suitable for the plastic pipe you are using. and at least 2 end caps ,The other three are optional and you may not really need them. and several lengths of storm water pipe to connect it all together. These split pieces of pipe are held in place with a small bolt inserted through a hole drilled in it and screwed up tightly to the metal bracket (see illustration). 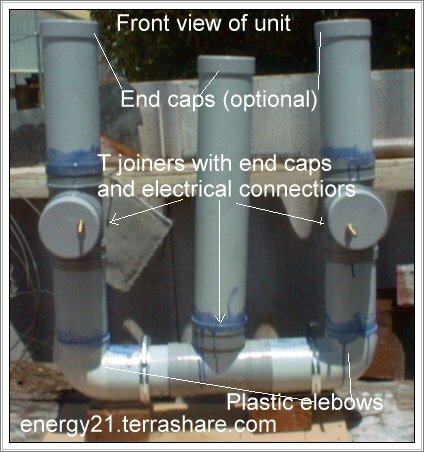 When the E shape pipe gas assembly is constructed,these separate cut off pieces of pipe fit over the bottom of gas unit piping and then hold it in place by means of a screwed metal pipe clamps and then is finally glued to reinforce the mounting section and the gas producing unit upright position. Now that you have everything, place together as shown in the above photograph. Drill one small hole in each of two end caps, and then insert by screwing a brass or stainless steel threaded bolt into each cap ,(head should be on the inside with a couple of good washers) must be air tight. Start with bottom section first with the the middle T and the two U elbows. Glue the center pipe in place. Then glue the two outer up right pipe sections. Check to see that you can get the next T connection in place,if your stainless steel mesh prevents an easy join, cut the mesh to suit and try again. When you are happy with it, join some stainless steel wire to each mesh section, and then glue the plastic tee's in place leaving the wire coming out so that it can be joined to the end cap conductor connection with ease . Glue the end caps in place and finish putting the other two pipe uprights in in place. 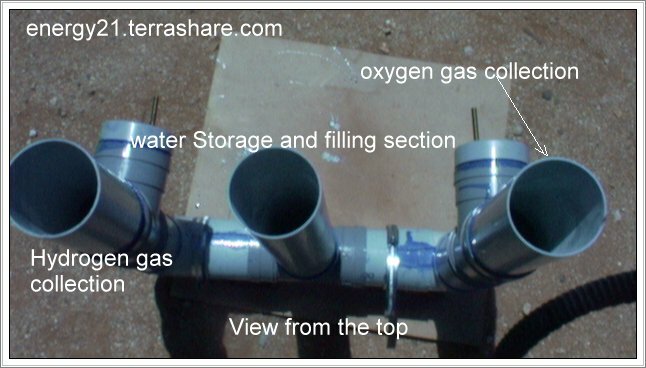 Fill with water mixed with some caustic soda (sodium hydroxide) or baking soda through the middle pipe filler section (middle pipe),fill until water is level with the terminal connections on the other two pipes section. Connect a lead from a battery or other type of power source ( low voltage direct current ) to one side and the other lead to the other side bolt connection. If every thing has been connected correctly you should see bubbles of hydrogen coming from one pipe collector and oxygen from the other. Please note this web page has been presented for educational purpose's only and no responsibility will be taken for misuse of this information. After constructing this unit, whilst it does produce gas, I was rather disappointed in the results and volume as compared with the results of the following pages mentioned below. 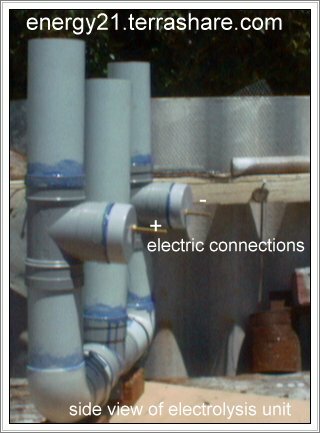 This may be due to positioning the the electrodes at either end of the unit,for constructors, I would now suggest using one outside pipe, and the inner pipe, instead of the other outer leg,that would make the functioning unit look like a U shaped pipe arrangement. This would also shorten the distance between electrodes, which may improve the gas output. If you want to do away with the extra leg, this may also improve the functioning of unit,that is if you don't need a water inlet. 2.-- Andriah Puharich system, read Patent # 4394230 , low volts AC applied to resonant cavity of mild salt water, at 600 Htz frequency, with necessary upper harmonics passable through amplifier, Hydrogen proton twists away from oxygen, cell prototype ran motor home on water. Patent lists 91% efficiency and readable on Internet. - Search engine "Google" - See "Puharich Paper" also at - The Puhrich Papers on electrolysis (Vibrations Split Molecules). Video also available. 4.-- Mr Rhodes had first Patent on "Brown&rsquo;s gas", read also Yull Brown&rsquo;s Patent # 4014777, originally written up as mixture of diatomic and monatomic hydrogen and oxygen, special gas generated in cell center and at electrodes where regular diatomic gases bubble off, no electrolyte temp increase, now told to be expanded water ( electrified water vapor ), browns gas cell of somewhat higher energy content, runs one cyl. engine with alternator keeping battery charged. Gases without air implodes, with air explodes. Also add to autos to increase gas mileage with gasoline, and give cleaner exhaust. See Eagle Research , George Wiseman on Internet - Manuals for sale. See also back issue magazines - Explore, vol 3, numbers 2,3,6,, 1992 "Fire From Water"
5.-- Sam Leach system, read Patents # 4148701, # 4113589, # 4272345, steam heat releases photons vibrations of 1.3 Mhz frequency from composite coating on inner cylinder walls of heat exchanger, steam breaks up to hydrogen and oxygen, part of outlet gases used to keep boiler going. 6.-- Hefferlin manuscript, see "Burn Water For Fuel" in Vol 20, no. #6, Sept 1946 Amazing stories Magazine, high voltage high frequency tesla coil sparks arc in steam chamber releasing fuel gases. Hefferlin&rsquo;s prop plane engine ran on water during 1940&rsquo;s . He emigrated to US temporarily, to escape Nazis and keep his invention from becoming part of their war machine. 7.-- Archie Blue system, read Patent # 4124463, air pumped in bottom of regular electrolysis cell increases efficiency by bubbles sweeping ions off of perforated disc plates, engine runs on the fuel gases and air after passing through safety water can. Sliding adjustable wire resister used as 40 amp speed control, along with 12 volt mattress inflater pump. Cell has no divider screen - raises efficiency . Fuel gases used immediately, no tank storage with this or other auto systems listed in this report. 8.-- French patent # 2302420 , of 1976, translated, engine runs on water using spiral wrapped heat exchanger on exhaust, alcohol fuel discontinued after exhaust manifold up to temperature, water in carb turns into super heated steam, then fuel gases of hydrogen and oxygen. Another similar wire feed - hydrogen cell found in back issues - Automotive Engineering Magazine, (1.1 liter Ford van runs on water, International Energy Commission,) see editorials vol 93, Dec 1985, pg 100-101, Vol 93, Aug 1985, pg 81-84, Vol 94, Feb 1986, pg 41, Vol 93, Nov 1985, pg 28, Vol 93, Oct 1985, pg 26-32. Magnesium + aluminum alloy wire oxidizes during current flow from rebuilt higher voltage alternator. 11.-- Oil furnace runs on water - (a modification could be adapted to autos) Read Patent #2863499, Stainless steel tubing coil in fire pot heated with fuel oil initially only, 90 lb pressure water turns to super heated steam at 1500 degrees, goes through T fitting with oil and comes out spray nozzle as hydrogen gas torch. oil shut off, furnace continues to run on water, Patent office allowed only 50 % increase in efficiency with oil to be written, not what manuscript submitted. Electric motor with dual shafts run two 90lb oil hydraulic fluid pumps. The vibration of flowing steam molecules increases and enters shockwave effect as going into area of low ambient pressure air when exiting nozzle. Smaller unit built with fire brick, vertical tubing coil, valves, outlet ring of pores at bottom. Initial alcohol flame heat to 1500 degrees, then light off gases coming from circular burner ring. 13.-- Magnets' magnetic fields, read Patent # 2016442, separates water molecules to gases, even without electricity applied. Can also do your own experiment- plastic plumbing T fitting, 2 steel bolts, 2 magnets , vinegar water, jumper wire with clips. With bolts jammed into ends of tube , leave small gap for water . apply north and south poles to steel, and visually see bubbles in tube center. Cell still works with bolts shorted on outside. See also back issue Popular Science June 1944, "Magic With Magnetism". 15. -- "HYPER GAS" - latest term referred to of several experimenter&rsquo;s regular electrolysis cells that seem to create fast volume gases evolution for short period then stop, without change in input power draw. Suggested by Mr. George Wiseman as being ionized hydrogen and oxygen or just faster rate Brown&rsquo;s gas. Most likely the same products of intermittent resonance phenomena similar to Meyers and Puharich methods, but only under exact cell conditions. Set up for Hyper Gas is unknown and must be replicated. (Clue - capacitive power supply of pulsing half / full wave DC was used in every case having output riding harmonics) - Series AC capacitor - current limiting reactance type with full wave bridge rectification. 16. -- U. S. Patent # 4071608, Richard Diggs. Black painted, heat absorbing heat exchanger, heated by sun focused rays using mirror array and automatic sun tracker, heats water to superheated steam at 4000 degrees. Static steam pressure generated is separated into gases by passive stainless steel fine mesh screens by molecular sizes. Free ground water and sunshine makes free fuel ! Compressor pressurizes the hydrogen into storage tanks. Hydrogen can be mixed with ammonia and trucked as a liquid. 17.-- Over unity energy from "Cold Fog Explosions" Yes, not a misprint. Bench set up with high voltage DC capacitor that discharges into milliliter of water delivers instantaneous huge pressure that surges upward through vertical steel pipe, as water vapor gas of same polarity repel each other. Punches hole through thin aluminum plate , or expends kinetic energy on upward moving wood block. Liquid to gas state change. 10% of circuit energy input only used in actual conversion - must be a better way! (Extracting Intermolecular Bond Energy From Water, by Peter Graneau- Infinite Energy Magazine, Vol 3, no. 13, + 14, 1997 double issue, pages 92-95) . Video also available. Russ, - alternate energy researcher.